I've been busy creating new things. Mainly spirit boards, but I've done some other things here and there. I've begun woodburning some runes and painting a rune casting board, a clay goddess, I picked up some wood ornaments to paint yesterday. I have visions of bright red cardinals sitting on a snow covered pine tree. I have also had an idea for a new type of spirit board and I began that today. My latest board is my most favorite board. I love how the colors turned out and just how everything came together. 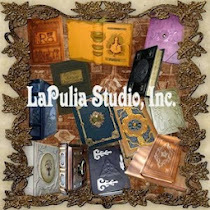 It is now available to purchase at Lapulia Studios. If you have never visited Lapulia, you really should. 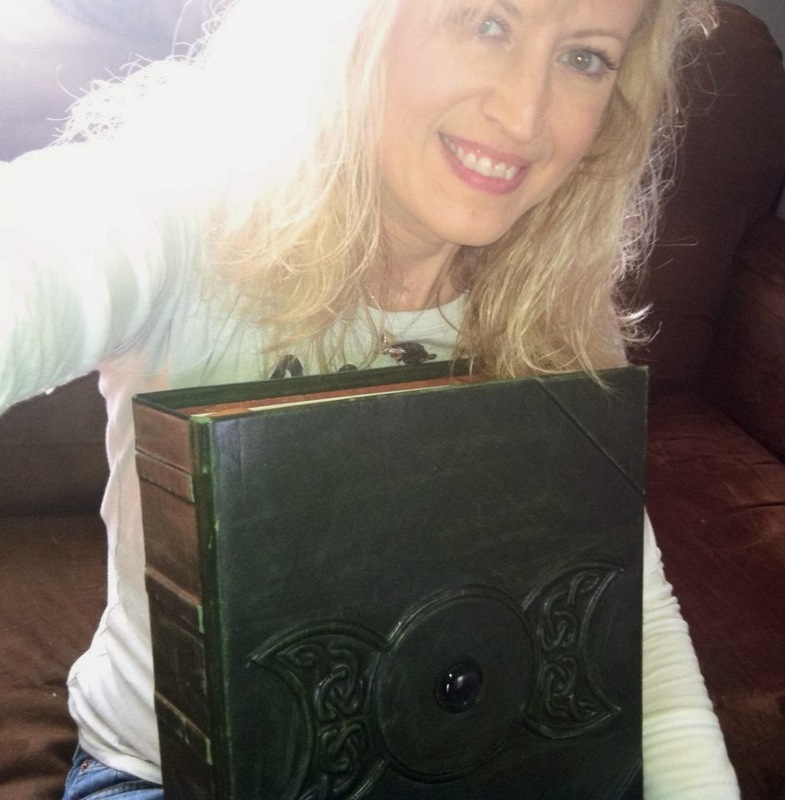 Besides my awesome spirit board selection, they have the most gorgeous magickal books! They are so nicely made. And yes, I own one. I have the Celtic Moon Book of Shadows Here is a picture of me holding it to show you the sizes of their books. If you decide to purchase one know that Rita and her people will make a magickally delicious book of beauty just for you. Anyway, my latest boards are now available on Lapulia. Each of these are lovingly handpainted by me and only me. My boards are works of art that can be put on display when not in use. I just finished the Edgar Allan Poe Board. 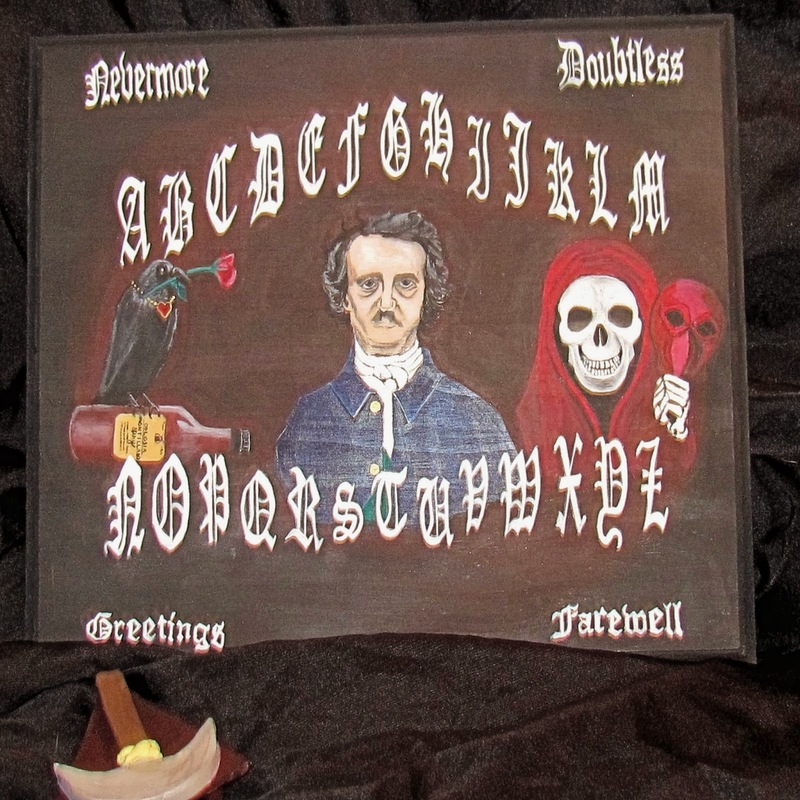 Edgar is in the middle with the Masque of the Red Death on the right, The Raven with the Cask of Amontillado, The Telltale Heart are on the left. Nevermore for No and Doubtless for Yes. The Pit and the Pendulum is represented by the pendulum planchette. 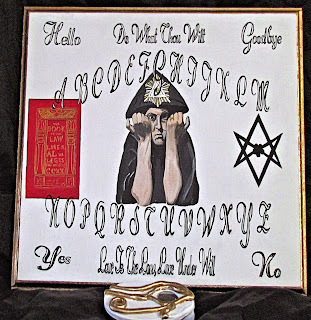 My next board is the Aleister Crowley board. I am proud as punch with this one. I think it turned out quite nicely. He has the Book of the Law on his left and the Unicursal Hexagram on his right. He also has an Eye of Horus planchette. I have 3 other designs but these are my two latest designs. I have made a new, wonderful friend. 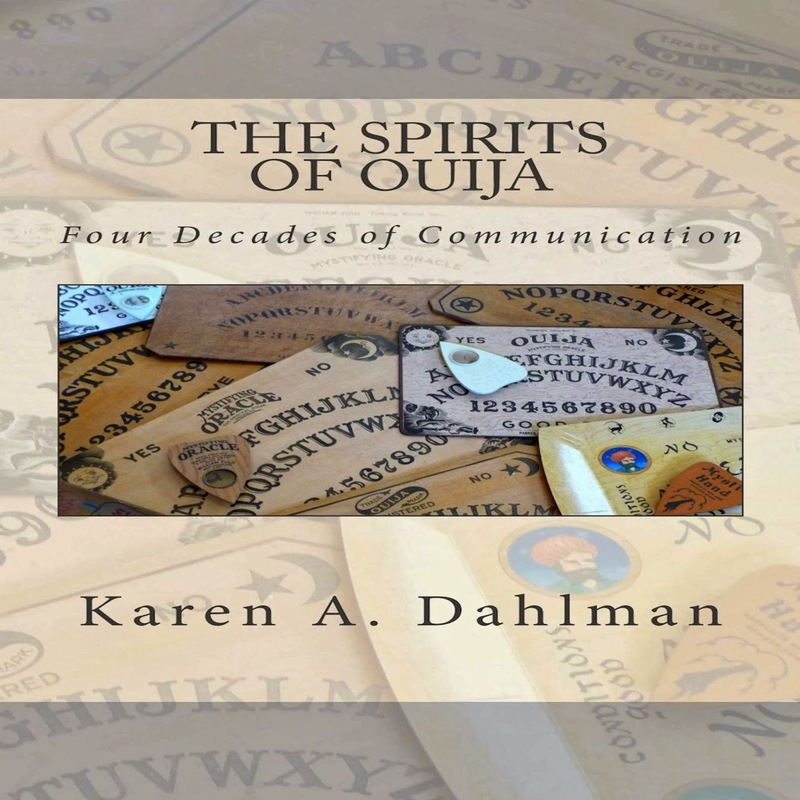 She is an author of the book "The Spirits of Ouija" Karen A. Dahlman is just an excellent author on this subject. I had thought about writing my own pamphlet how-to to send with each of my board sales, but this book was recently released and I purchased a copy. OH MY! If I was going to write a book about my own experiences, it would be like this book. So, I spoke with Karen and she granted permission for me to include this book with my board sales. I mean, I can't send tools such as this out into the world all willy nilly with no instruction. 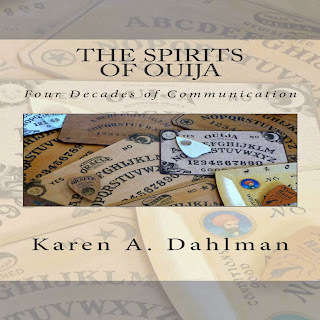 You have to know what you are doing and this book includes an opening prayer, 13 steps for use, history of ouija boards, Karen's personal experiences and lots more! In this "Ouija Tell All" a 40-year odyssey spent communicating with spirit friends from the Great Beyond! They speak of personally-relevant insights, beneficial healing, closure on grief, opening to greatness, developing your empowerment, spiritual growth and soul evolution, to name a few. Karen shares with you the unfair misconceptions Ouija has received over the years, from its fall from grace of the parlor rooms of yesteryear to the forgotten corners of today's closets. 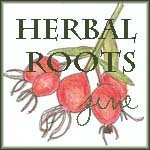 Karen provides the how to's, the don'ts, the warnings, the recommendations and identifies various consciousness with whom she has communicated. 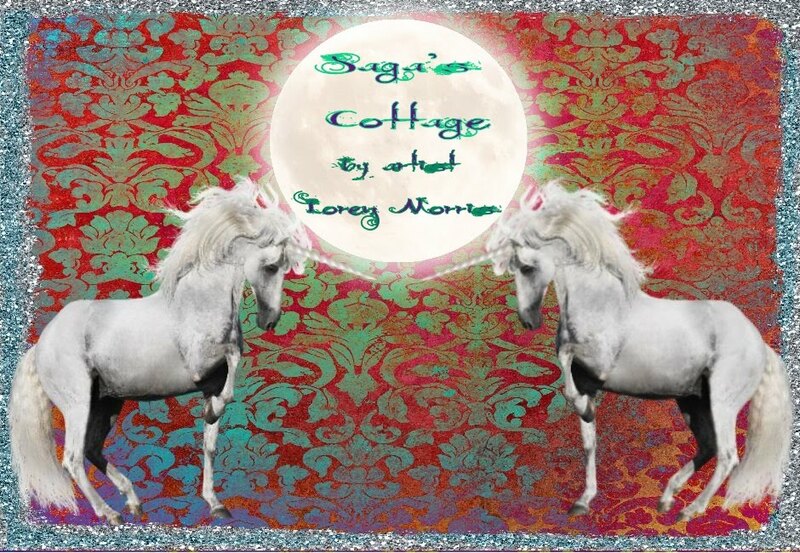 Come read stories of animal communication, specifically pets we love, dead and alive! Yes, I said "alive" Plus, you'll learn how to use Ouija to tap into your own divine guidance, your Higher Self, and learn to listen to this guiding principle that resides within. Karen shares actual accounts from her sessions, including the various entities you can meet, what happens when we are dead, and what happens in between lives. Get ready for a phenomenal exploration into consciousness. Come with Karen as she takes you behind the veil to meet her spirit friends, up close and personal. A whole new world is awaiting you!